In high school, Eletha sent her application to the Hispanic Heritage Foundation and received the 2006 Engineering & Mathematics Youth Award, sponsored by ExxonMobil, which helped to make her education at M.I.T. possible. So far, she has interned at NASA and coordinated her school’s Science and Technology Program, and she is preparing to travel to Cameroon for a project that will improve the energy grid. Unfortunately, Eletha is the exception, not the rule, when it comes to Latinos in the science, technology, engineering and math (STEM) fields. The educational pipeline that prepares Latino students to enter STEM careers “is all but broken,” according to Out Before the Game Begins, a Public Agenda report commissioned by the IBM International Foundation. Despite proof of increased interest in STEM careers among Latino high school students shown in a recent study by the Hispanic Heritage Foundation, the scarcity of Latino professionals remains. “As a nation, we are not yet in a crisis, but there are definite warning signs that lead us to believe that if we don’t do something to increase participation of underrepresented populations [in STEM fields], we could have a problem,” says Bill Valdez of the Workforce Development Office of the U.S. Department of Energy’s Office of Science. “Since it is a decadal issue, we need to get started now.” Without action to turn the course, not only will U.S. businesses suffer, but also the country will lose the ability to compete globally and human progress driven by technological advancement will be threatened as a whole. The solution, however, could mean a tremendous opportunity for Latinos, the fastest growing population and the largest minority group in the country. With a healthy mix of concern about what will happen if the demand is not met and excitement about the potential, public, private and nonprofit sectors are taking steps to ameliorate the STEM dilemma. “Stimulating Latino interest in STEM careers, developing strategies to improve STEM education, and finding ways to effectively involve all stakeholders—students, parents, educators, policymakers, and the corporate and philanthropic sectors—is crucial for the development of the Hispanic community, and also for the future of our nation,” concludes the America’s Competitiveness Summit Report. This report resulted from the May 2008 IBM inaugural “America’s Competitiveness: Hispanic Participation in Technology Careers” summit, where leaders from education, government, community organizations and business gathered. Stanley Litow, Vice President of Corporate Citizenship and Corporate Affairs for IBM, describes it as “a perfect storm.” The swirling factors include a large number of baby boomers moving to retirement, a declining number of people coming into the workforce, a dearth of qualified math and science teachers, and a significant population shift largely due to growth in the Latino population. “If we just keep doing what we’re doing, we’re going to find fewer and fewer people filling a larger and larger number of jobs,” Litow says. In the last several decades, the U.S. economy has changed from skill-based to knowledge-based, requiring many more technically skilled workers to meet workforce demands and maintain the country’s position as an innovation leader. But the current education system simply isn’t turning out enough U.S.-trained STEM professionals to meet the continually growing demand. For example, half of all U.S. engineers will retire with the baby boom generation while the estimated number of 22-year-olds earning science and engineering bachelor’s degrees continues to drop. “Baby Boomers are the last generation that can afford to have the traditional white, male workforce. That demographic just isn’t realistic anymore,” says Trina Ostrander, manager of development agreement and community relations for Bayer HealthCare Pharmaceuticals. According to the U.S. Bureau of Labor Statistics, jobs in STEM fields will grow approximately 22% from 2004 to 2014, requiring nearly two million new STEM professionals by 2010 to fill the void left by retiring Baby Boomers. Given population numbers, the necessary supply to meet future workforce demands will inevitably come from the Latino population. Latinos currently comprise more than 50% of the school-aged population and more than 14% of the total U.S. population, and the U.S. Census Bureau predicts the number will reach 30% by 2042. At the same time, Latino students are the most likely to drop out of high school, among the least likely to have access to qualified math and science teachers, more likely to confront economic and language barriers, and often face student-to-counselor ratios that are far under par. “…Hispanic youngsters are in effect barred from entering technical fields because their early science and math education is so inadequate,” according to Out Before the Game Begins. In addition, family issues and culture may play a role in Latino students’ likelihood to pursue STEM careers. A September 2008 IBM and Tomás Rivera Policy Institute study, STEM Professions: Opportunities and Challenges for Latinos, points out that Latino students often “balance work and school in order to provide for themselves and their families.” In some cases, it means forgoing an education in order to join the workforce and earn an income. Those who do enter college commonly find STEM-related courses too demanding when coupled with financial and family obligations. The study also reports that cultural traditions may perpetuate gender roles and encourage students to stay close to home, thus deterring some would-be STEM professionals. Experts agree that there’s no one way to weather the perfect storm. But based on research and best practices, a number of approaches have proved effective, and ongoing programs supported by corporations, government and nonprofit organizations are already showing positive results. In 2005, ExxonMobil partnered with professional golfer Phil Mickelson and his wife Amy to launch the Mickelson ExxonMobil Teachers Academy. The five-day program is designed to provide third- through fifth-grade teachers with the knowledge and skills necessary to motivate students to pursue careers in science and math. Each summer, nearly 600 third- through fifth-grade teachers from school districts across the country attend the camps in New Jersey, Texas and Louisiana. According to Cruz, the company also recently gave the largest corporate gift to date, $125 million, to the National Math and Science Initiative to expand programs with a proven track record of success to a national level. One program scheduled to scale up is Teach. Started at the University of Texas, UTeach encourages math and science majors to enter the teaching profession by offering an integrated degree plan, financial assistance, and early teaching experiences for undergraduates. IBM’s program, Transition to Teaching, also addresses the shortage of math and science teachers by enabling experienced employees to become fully accredited teachers after retiring from IBM. A lot of employees may not be interested in traditional retirement, Litow says, but they may never have considered teaching. Employees may participate in online and traditional courses, online mentoring, and student teaching to meet state teaching certification requirements. Employees choose the certification program that meets their needs, and IBM reimburses them up to $15,000 for tuition and stipends while they student teach. They are also allowed a leave of absence for up to one year to take intensive programs or to be student teachers. In addition to ensuring that qualified teachers are rearing the next generation, changing the way STEM subjects are taught may improve students’ aptitude and interest. “People from different backgrounds don’t always learn the same way,” says Bryan Iams, spokesperson for the Bayer Corporation. “Text book education isn’t always the best, most engaging way to keep students’ interest.” That’s why Bayer’s Making Science Make Sense (MSMS) program focuses on hands-on, inquiry-based science education in the classroom. Formally launched about a decade ago, MSMS operates at 12 Bayer sites across the country. As MSMS representatives, more than 1,000 Bayer employees go into schools and conduct basic science experiments that relate to real-world issues. Over the years, Iams says, students who are exposed to hands-on learning such as MSMS stay engaged in STEM subjects longer. “One of the best ways we can help our young people succeed in high school is to ensure that they see the connection between what they learn in school and what’s required in the workplace,” says Randall Stephenson, AT&T chairman and chief executive officer. As part of its $100 million Aspire program to promote high school success and workforce readiness, AT&T funds a student job shadow initiative with Junior Achievement, involving 400,000 AT&T employee hours and giving 100,000 students an up-close look at skills required for 21st century workforce success. Through job shadowing, students see exactly what’s in a day’s work at a large technology-based company. “The full range of positions are shadowed,” Sanford says, “from service reps all the way to the CEO.” Starting with in-classroom discussions with professionals to spending a day in the AT&T offices, the experience opens their eyes to where STEM studies can take them. “We get kids excited about careers, and that creates the desire to succeed academically,” Sanford says. In addition, the job shadow initiative introduces students to careers they may not have known existed or otherwise would have considered interesting without seeing it firsthand. A key setback in underrepresented communities is lack of exposure to career options. “Kids usually only see what their parents and peers do, so they may believe there aren’t many career options,” Sanford says. “We need to give these students a chance to see firsthand the types of options available and the skills they will newed to be successful in the future.” Introducing students to a variety of role models and careers opens a world of opportunity. The DOE seeks to send the message into communities that STEM careers are viable, profitable and valuable to society. National competitions, such as the National Science Bowl, the Real World Design Challenge and the Science and Engineering Research Challenge, invite students with an innate interest in STEM to participate, demonstrate their skills, and take home accolades and awards. “Once they go back to their communities with trophies [just like the football players], they are treated like rock stars …It’s all part of a larger affirmation. The parents appreciate it, and it validates that these careers are worth going in to,” Valdez says. By entering a competition, students self-identify as interested in STEM and become ready-made recruits. Once they are in the system, the DOE tries to filter them into programs where they are retained and mentored. George Cushman, founder of the Hispanic College Fund (HCF) refers to mentoring as “sending the elevator back down,” and it is imperative to continued growth in STEM. It is a key component of AT&T’s Aspire program, and IBM partners with community organizations to provide mentoring to help retain students. ExxonMobil also actively works to increase the number of mentors and role models in the community. In a partnership with the Hispanic Heritage Foundation (HHF), the company began honoring a leader in math and science as part of the annual Hispanic Heritage Awards ceremony, a celebrity-studded celebration of Latino contributions to arts and culture. The Science and Math honoree is the only non-celebrity recognized, although people often say the work he or she does is the most important, Cruz says. In a more involved model, the HCF’s Hispanic Youth Institute “works with at-promise Hispanic high school students to educate and inspire them to achieve a college education, pursue a professional career in business and STEM, and give back to their communities as leaders capable of affecting change.” Participants in the Institute begin at a Hispanic Youth Symposium, a four-day, three-night program that brings 100-200 Hispanic high school students to a college campus for workshops on accessing and affording college. Throughout the program, students are grouped into familias of 8 and led by one college student mentor per familia. They meet and interact with professionals who introduce them to real-world career opportunities. Lockheed Martin leads a popular activity in which students are asked to build an airplane with Legos. They have fun while working and usually don’t realize what they are doing is actually engineering. “They use the same exercise with the executives. The kids tend to outperform them because their minds are clear and unbiased,” Cushman says. The HHF provides mentoring and assistance for Latino college students and recent graduates through Latinos on Fast Track (LOFT). It’s only a myth that there isn’t enough Latino talent, says Antonio Tijerino, HHF president and CEO. It just needs to be identified and nurtured. “We need to do a better job of increasing the [talent] pool,” he says. “We need to give young people the tools and power and capital, and then send them back into the community to be an advocate for STEM.” LOFT identifies and prepares emerging Latino professionals for leadership in the workforce through networking events, mentoring, workforce development, interview and resume training, industry-tailored programs, internships, fellowships and full-time placement. In April, HHF launched a new program, called miMentors. In Partnership with AT& T and the American School Counselor Association, miMentors supports high school guidance counselors in order to raise Latino high school graduation and college attendance. HHF’s network of emerging leaders steps in to help overloaded counselors provide much-needed support to Latino high school freshmen. The program is currently being piloted in Houston, San Francisco, Miami, New York, and the Greater Washington, DC Area. 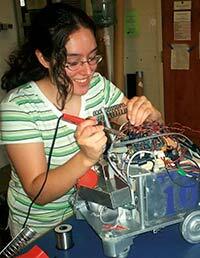 HHF and HCF both help students to overcome the final hurdle of entering a STEM career—paying the bill. Though the organizations can’t fund every deserving Latino student with college aspirations, their programs do help hundreds make the college dream a reality through scholarships. Each year, HHF holds the Hispanic Heritage Youth Awards, which awards young Latino leaders with educational grants for college. Through high profile regional events and the National Hispanic Heritage Youth Awards Ceremony, HHF positions the young leaders as role models in their communities. ExxonMobil sponsors the Engineering and Mathematics award each year. Bayer Corporation offers a program that also removes financial barriers called Biotech Partners, a program designed to help local students get biotechnology jobs starting in their junior year in high school. They begin with a hands-on course in biotechnology the first year, continue with a paid summer internship, and then enter the program’s senior year course, which may include paid, part-time work at Bayer. After high school graduation, students work another paid summer internship, then enter Laney College’s Bioscience Career Institute in Oakland for one year and work part-time around their school schedule. Students then can choose to continue into a traditional four-year degree program or leave school, usually for a position at Bayer or another area biotech company. Over the last five years, Bayer’s Ostrander reports, Biotech Partners boasts a high school graduation rate of 100% versus the state’s average of 70%. “[In Biotech Partners] they get to see something happen as a result of their actions. If you write an essay or a book report, nothing has happened. You’ve just had a boring couple of hours,” Ostrander says. She also attributes the success to the opportunity to start working and making money. She has seen a number of cases of kids working to help support their families. Biotech Partners allows them to earn an income and an education. The Hernandez family proves that success is attainable. As the children of immigrants who moved to California from Mexico in the late 1980s, the Hernandez children faced language barriers and financial disadvantages when they enrolled in new schools in the United States. The Biotech Partners program was in its inception, and the oldest Hernandez child, Roberto, took a chance and signed up. His sister, Griselda, was already a teenage mother when she entered the program. Since then, Roberto, 30, and Griselda, 28, both graduated from the Biotech Partners program and both work for Bayer Corporation in West Berkeley. Their younger brother Jesus, 17, is currently in the program learning about complex topics like gene splicing and cell transformation at Berkeley High and aspires to be a bioengineer. At age 15, the youngest sister, Elvia, is on track to enter the program and become the fourth biotech professional in her family. Once barely expected to complete high school, all four Hernandez children are now poised to land some of the highest paying jobs available in California’s Bay Area.